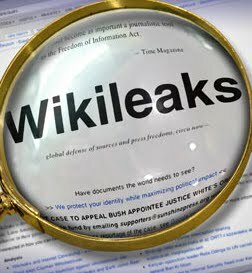 Land Destroyer: Wikileaks Strikes Again: Asian Summer? Wikileaks Strikes Again: Asian Summer? Editor's Addition: The use of Wikileaks cables, which are essentially nothing more than the dubious word of US diplomats, is a classic case of "appeal to authority." Appeal to authority states: Source A says that p is true. Source A is authoritative. Therefore p is true. Marshall's "Thai Story" is based on the word of US diplomats via Wikileaks cables. US diplomats have authority, therefore Marshall's "Thai Story" is true. Absent of any actual verifiable evidence, Marshall's "Thai Story" represents what is called a faulty generalization supported only by the questionable credibility of the diplomats Marshall cites for his work. Whatever side you are on in any particular debate, when someone puts forth "evidence" with faulty generalizations, especially someone who should know better, you should look elsewhere for a more credible argument. If none can be found, you may just be on the wrong side of the debate. Unfortunately, Marshall's "Thai Story" isn't aimed at those familiar with faulty generalizations, but rather those who will soon read his Thai translation in rural villages throughout globalist-stooge Thaksin Shinawatra's political strongholds. With the coaching of Thaksin's political lieutenants, the "Thai Story" will be accepted as fact, or as Marshall himself puts it, as the "truth." Please also note that US National Endowment for Democracy-funded Prachatai has dutifully carried Marshall's story on their propagandizing website. The National Endowment for Democracy has been credited by the alternative media and the likes of the New York Times for funding, training, and supporting Western-backed uprisings throughout the world, most recently in the Middle East's "Arab Spring." The harbinger of foreign-funded sedition reveals itself in yet another nation. Bangkok, Thailand June 23, 2011 - When Reuters' journalist Andrew Marshall isn't piecing articles together citing paid lobbyists like Robert Amsterdam, he is sifting through Wikileaks cables looking for damning hearsay and gossip to malign Thailand's revered monarchy just days before a highly contested national election. As in Tunisia and Egypt before the US-funded "Arab Spring" was lit ablaze, Wikileaks again seems to be the harbinger of foreign-funded unrest about to unfold in yet another nation. To illustrate just how tenuous Marshall's Wikileaks-based "work" is, consider the wording in the UK's Independent article where phrases like "alleges," "apparently," and a video that emerged "which seemed to show," punctuate nearly every sentence. This is because Wikileak cables are not verified facts, nor do they even constitute any form of real evidence. In fact, all they are, are alleged conversations, or alleged conversations about alleged conversations, sometimes as far as thrice removed from the supposed source. The only "credibility" these cables carry is as much credibility as the US diplomats that wrote them have - which admittedly isn't much. Marshall explains his reasons for quitting his job at Reuters to write what he is calling "Thai Story" in another piece published in the Independent explaining, "three months ago I gained access to the "Cablegate" database of confidential US cables believed to have been downloaded by US soldier Bradley Manning in Iraq. There are more than 3,000 cables on Thailand. Unlike almost all reporting on the country, the cables do not mince words when it comes to the [Thai] monarchy. As I read them I realised two things. They could revolutionise our understanding of Thailand. And there was no way I could write about them as a Reuters journalist." Just how Marshall believes the questionable word of US diplomats could "revolutionise" our understanding of Thailand, assuming we are objective people who base such an understanding on facts, not hearsay from less than credible sources, is not entirely understood. How it may serve as fodder for Thailand's struggling foreign-funded opposition is quite obvious. Marshall continues by saying, "I just could not accept giving up and ignoring the truth about Thailand. Thai people deserve the right to be fully informed, to debate their future without fear. With great regret, I resigned from Reuters at the start of June to publish my article for anybody who wants to read it." Again, how exactly the word of less than reputable US diplomats constitutes "the truth about Thailand" escapes rational explanation. Marshall also claims, "Thailand is sliding backwards into authoritarianism and repression. And one stark indication of this is that just saying it is illegal." He cites "Thai-British professor" Giles Ungpakorn, who he claims "is living in exile in London after fleeing Thailand following accusations he defamed the palace." Marshall conveniently omits that Ungpakorn was a leading member of billionaire globalist-stooge Thaksin Shinawatra's "red shirt" movement, a confessed Marxist, and has on numerous occasions, along with fellow red-shirt leaders, suggested Thais take up arms to institute a Marxist socialist-welfare state. Either Marshall didn't do his research, or he is intentionally lying to his audience to garner sympathy and invoke emotions, rather than provide credible objective information for the rational, "fully informed" debate he claims to be seeking. "Professor" Ungpakorn is not hiding in the UK for insulting the palace, he is a co-leader in billionaire globalist Thaksin Shinawatra's red-shirt movement and a confessed Marxist promoting the use of arms to institute a socialist welfare state. Giles Ungpakorn's raving "Red Siam Manifesto" can be read here on Socialist Worker Online. A conveniently timed Wikileaks exposé: Not the first time. This surely isn't the first time Wikileak cables have been conveniently and purposefully spotlighted by the corporate-owned media in order to provide fodder for struggling foreign-backed opposition groups. The US-trained activists in Tunisia and Egypt received similar "helping hands" from Wikileaks, where cables featuring the gossip of US diplomats were credited for "sparking" the revolutions. Business Insider declared, "This Is The Wikileak That Sparked The Tunisian Crisis," referring to cables featuring US diplomats talking about the corruption of Tunisia's regime - a regime the US had been funding and training activists to overthrow years in advance, along side activists from Egypt, Yemen, and Syria. Convenient indeed. Wikileaks also has been busy post-revolution, bolstering the sinking ship of globalist-stooge Mohamed ElBaradei in Egypt who was pelted with rocks and called "an American agent" before cables "revealed" just how much disdain the US supposedly holds for the US International Crisis Group trustee. While the word of a US diplomat is fairly meaningless, and alone would be worth nothing, the Wikileaks phenomenon actually relies entirely on the corporate media's meticulous grooming of Julian Assange's credibility and the "threat" he poses to corrupt individuals. In reality, it is nothing more than a dressed up, crass stunt designed for the weakest, most impressionable of minds, and Reuters' Andrew Marshall is just the latest incarnation of this tiring gambit. Marshall is simply serving as a clearing house for a carefully timed corporate-media exposé featuring US diplomats and their irrelevant opinions regarding their particular analysis of Thailand. Considering that the Thai opposition's leader, Thaksin Shinwatra, has been working directly with some of the largest, most influential lobbying firms in the US, including Amsterdam & Peroff (mentioned above as inspiration for an entire article by Marshall), Baker Botts, Barbour Griffith & Rogers, Edelman, and Kobre & Kim since 2006, it would be safe to say these "diplomats" and their "cables" represents a United States government intent on regime change and the reinstatement of Thaksin as Thailand's leader. These diplomats and the corporatocracy they represent have an invested interest in not only criticizing Thailand and its various institutions, but undermining and dividing Thailand's long standing unity in order to overthrow and despoil the nation. With the engineered "Arab Spring" turning into a regional war of aggression, instigated by the West via NATO, and the stated necessity of encircling and containing China, Thailand, Myanmar, and other Southeast Asian nations are next on the list for destabilization. Thailand in particular serves as a regional hub for the globalists' seditious "civil society" networks, as well as a logistical and economic hub. It has also been suffering political chaos since Thaksin's ouster in 2006 and is a logical starting point for a potential "Asian Summer." Thailand's elections are in July, expect Marshall's collection of US diplomatic hearsay to be cited, just as Wikileaks was for Tunisia, as the rhetorical excuse for what the globalists have been engineering for years. For more on Thailand, please visit the Thailand Archives.